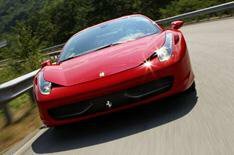 Ferrari 458 Italia: full gallery | What Car? Ferrari has released more pictures of the stunning new 458 Italia. The all-new car - a replacement for the F430 - is due to go on sale in 2010. The latest photos show the interior in detail for the first time. As with the exterior, the influence of Ferraris F1 racing cars is strong. The 458 Italia's exterior styling is equally radical and also has clear F1 cues. Ferrari says the styling is 'a complete departure from the past' and that it has been heavily influenced by the need for aerodynamic efficiency. There are dramatic air vents at the front of the car, along with 'aerolastic winglets' that generate downforce and deform to cut drag as speed increases. Three centrally-mounted exhaust tailpipes dominate the rear of the car, while tail lights placed at the extremes of the bodywork accentuate its squat stance. The high-tech approach continues with a new direct-injection 4.5-litre, 562bhp V8 engine, a seven-speed semi-automatic transmission and the extensive use of advanced material to keep weight down. A single control will allow drivers to alter the settings of the stability control system, throttle sensitivity and braking at the flick of a switch. The 458 Italia will be officially unveiled at the Frankfurt motor show in September. Prices haven't been announced, but they're likely to start at around 150,000 when the 458 Italia goes on sale next year.